German critic and dramatist, born at Kamenz in Upper Lusatia (Oberlausitz), Saxony, on the 22nd of January 1729. His father, Johann Gottfried Lessing, was a clergyman, and, a few years after his son's birth, became pastor primarius or chief pastor of Kamenz. After attending the Latin school of his native town, Gotthold was sent in 1741 to the famous school of St. Afra at Meissen, where he made such rapid progress, especially in classics and mathematics, that, towards the end of his school career, he was described by the rector as "a steed that needed double fodder." In 1746 he entered the University of Leipzig as a theological student. The philological lectures of Johann Friedrich Christ (1700-1756) and Johann August Ernesti (1707-1781) proved, however, more attractive than those on theology, and he attended the philosophical disputations presided over by his friend A. G. Kästner, professor of mathematics and also an epigrammatist of repute. Among Lessing's chief friends in Leipzig were C. F. Weisse (1726-1804) the dramatist, and Christlob Mylius (1722-1754), who had made some name for himself as a journalist. He was particularly attracted by the theater then directed by the talented actress Karoline Neuber (1697-1760), who had assisted Gottsched in his efforts to bring the German stage into touch with literature. Neuber even accepted for performance Lessing's first comedy, Der junge Gelehrte (1748), which he had begun at school. His father naturally did not approve of these new interests and acquaintances, and summoned him home. He was only allowed to return to Leipzig on the condition that he would devote himself to the study of medicine. Some medical lectures he did attend, but as long as Neuber's company kept together the theater had an irresistible fascination for him. In 1748, however, the company broke up, and Lessing, who had allowed himself to become surety for some of the actors' debts, was obliged to leave Leipzig too, in order to escape their creditors. He went to Wittenberg, and afterwards, towards the end of the year, to Berlin, where his friend Mylius had established himself as a journalist. In Berlin Lessing now spent three years, maintaining himself chiefly by literary work. He translated three volumes of Charles Rollin's Histoire Ancienne, wrote several plays -- Der Misogyn, Der Freigeist, Die Juden -- and in association with Mylius, began the Beiträge zur Historie und Aufnahme des Theaters (1750), a periodical -- which soon came to an end -- for the discussion of matters connected with the drama. Early in 1751 he became literary critic to the Vossische Zeitung, and in this position laid the foundation for his reputation as a reviewer of learning, judgment and wit. At the end of 1751 he was in Wittenberg again, where he spent about a year engaged in unremitting study and research. He then returned to Berlin with a view to making literature his profession; and the next three years were among the busiest of his life. Besides translating for the booksellers, he issued several numbers of the Theatralische Bibliothek, a periodical similar to that which he had begun with Mylius; he also continued his work as critic to the Vossische Zeitung. In 1754 he gave a particularly brilliant proof of his critical powers in his Vademecum für Herrn S. G. Lange; as a retort to that writer's overbearing criticism, Lessing exposed with scathing satire Lange's errors in his popular translation of Horace. 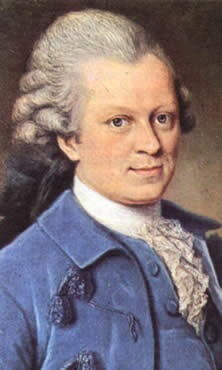 By 1753 Lessing felt that his position was sufficiently assured to allow of him issuing an edition of his collected writings (Schriften, 6 vols., 1753-55). They included his lyrics and epigrams, most of which had already appeared during his first residence in Berlin in a volume of Kleinigkeiten, published anonymously. Much more important were the papers entitled Rettungen, in which he undertook to vindicate the character of various writers -- Horace and writers of the Reformation period, such as Cochlaeus and Cardanus -- who had been misunderstood or faisely judged by preceding generations. The Schriften also contained Lessing's early plays, and one new one, Miss Sara Sampson (1755). Hitherto Lessing had, as a dramatist, followed the methods of contemporary French comedy as cultivated in Leipzig; Miss Sara Sampson, however, marks the beginning of a new period in the history of the German drama. This play, based more or less on Lille's Merchant of London, and influenced in its character-drawing by the novels of Samuel Richardson, is the first bürgerliches Trauerspiel, or "tragedy of common life" in German. It was performed for the first time at Frankfort-on-Oder in the summer of 1755, and received with great favor. Among Lessing's chief friends during his second residence in Berlin were the philosopher Moses Mendelssohn (1729-1786), in association with whom he wrote in 1755 an admirable treatise, Pope ein Metaphysiker! tracing sharply the lines which separate the poet from the philosopher. He was also on intimate terms with C. F. Nicolai (1733-1811), a Berlin bookseller and rationalistic writer, and with the "German Horace" K. W. Ramler (1725-1798); he had also made the acquaintance of J. W. L. Gleim (1719-1803), the Halberstadt poet, and E. C. von Kleist (1715-1759), a Prussian officer, whose fine poem, Der Frühling, had won for him Lessing's warm esteem. In October 1755 Lessing settled in Leipzig with a view to devoting himself more exclusively to the drama. In 1756 he accepted the invitation of Gottfried Winkler, a wealthy young merchant, to accompany him on a foreign tour for three years. They did not, however, get beyond Amsterdam, for the outbreak of the Seven Years' War made it necessary for Winkler to return home without loss of time. A disagreement with his patron shortly after resulted in Lessing's sudden dismissal; he demanded compensation and, although in the end the court decided in his favor, it was not until the case had dragged on for about six years. At this time Lessing began the study of medieval literature to which attention had been drawn by the Swiss critics, Johann Jakob Bodmer and Breitinger, and wrote occasional criticisms for Nicolai's Bibliothek der schönen Wissenschaften. In Leipzig Lessing had also an opportunity of developing his friendship with Kleist who happened to be stationed there. The two men were mutually attracted, and a warm affection sprang up betweem them. In 1758 Kleist's regiment being ordered to new quarters, Lessing decided not to remain behind him and returned again to Berlin. Kleist was mortally wounded in the following year at the battle of Kunersdorf. Lessing's third residence in Berlin was made memorable by the Briefe, die neueste Literatur betreffend (1759-65), a series of critical essay -- swritten in the form of letters to a wounded officer -- on the principal books that had appeared since the beginning of the Seven Years' War. The scheme was suggested by Nicolai, by whom the Letters were published. In Lessing's share in this publication, his critical powers and methods are to be seen at their best. He insisted especially on the necessity of truth to nature in the imaginative presentation of the facts of life, and in one letter he boldly proclaimed the superiority of William Shakespeare to Pierre Corneille, Jean Racine and Voltaire. At the same time he marked the immutable conditions to which even genius must submit if it is to succeed in its appeal to our sympathies. While in Berlin at this time, he edited with Ramler a selection from the writings of F. von Logau, an epigrammatist of the 17th century, and introduced to the German public the Lieder eines preussischen Grenadiers, by J. W. L. Gleim. In 1759 he published Philotas, a prose tragedy in one act, and also a complete collection of his fables, preceded by an essay on the nature of the fable. The latter is one of his best essays on criticism, defining with perfect lucidity what is meant by "action" in works of the imagination, and distinguishing the action of the fable from that of the epic and the drama. In 1760, feeling the need of some change of scene and work, Lessing went to Breslau, where he obtained the post of secretary to General Tauentzien, to whom Kleist had introduced him in Leipzig. Tauentzien was not only a general in the Prussian army, but governor of Breslau, and director of the mint. During the four years which Lessing spent in Breslau, he associated chiefly with Prussian officers, went much into society, and developed a dangerous fondness for the gaming table. He did not, however, lose sight of his true goal; he collected a large library, and, after the conclusion of the Seven Years' War, in 1763, he resumed more enthusiastically than ever the studies which had been partially interrupted. He investigated the early history of Christianity and penetrated more deeply than any contemporary thinker into the significance of Spinoza's philosophy. He also found time for the studies which were ultimately to appear in the volume entitled Laokoon, and in fresh spring mornings he sketched in a garden the plan of Minna von Barnhelm. After resigning his Breslau appointment in 1765, he hoped for a time to obtain a congenial appointment in Dresden, but nothing came of this and he was again compelled, much against his will, to return to Berlin. His friends there exerted themselves to obtain for him the office of keeper of the royal library, but Frederick had not forgotten Lessing's quarrel with Voltaire, and declined to consider his claims. During the two years which Lessing now spent in the Prussian capital, he was restless and unhappy, yet it was during this period that he published two of his greatest works, Laokoon, oder über die Grenzen der Malerei und Poesie (1766) and Minna von Barnhelm (1767). The aim of Laokoon, which ranks as a classic, not only in German but in European literature, is to define by analysis the limitations of poetry and the plastic arts. Many of his conclusions have been corrected and extended by later criticism; but he indicated more decisively than any of his predecessors the fruitful principle that each art is subject to definite conditions, and that it can accomplish great results only by limiting itself to its special function. The most valuable parts of the work are those which relate to poetry, of which he had a much more intimate knowledge than of sculpture and painting. His exposition of the methods of Homer and Sophocles is especially suggestive, and he may be said to have marked an epoch in the appreciation of these writers, and of Greek literature generally. The power of Minna von Barnhelm, Lessing's greatest drama, was also immediately recognized. Tellheim, the hero of the comedy, is an admirable study of a manly and sensitive soldier, with somewhat exaggerated ideas of conventional honor; and Minna, the heroine, is one of the brightest and most attractive figures in German comedy. The subordinate characters are conceived with even more force and vividness; and the plot, which reflects precisely the struggles and aspirations of the period that immediately followed the Seven Years' War, is simply and naturally unfolded. In 1767 Lessing settled in Hamburg, where he had been invited to take part in the establishment of a national theater. The scheme promised well, and, as he associated himself with Johann Joachim Christoph Bode (1730-1793), a literary man whom he respected, in starting a printing establishment, he hoped that he might at last look forward to a peaceful and prosperous career. The theater, however, was soon closed, and the printing establishment failed, leaving behind it a heavy burden of debt. In despair, Lessing determined towards the end of his residence in Hamburg to quit Germany, believing that in Italy he might find congenial labor that would suffice for his wants. The Hamburgische Dramaturgie (1767-68), Lessing's commentary on the performances of the National Theater, is the first modern handbook of the dramatist's art. By his original interpretation of Aristotle's theory of tragedy, he delivered German dramatists from the yoke of the classic tragedy of France, and directed them to the Greek dramatists and to Shakespeare. Another result of Lessing's labors in Hamburg was the Antiquarische Briefe (1768), a series of masterly letters in answer to Christian Adolf Klotz (1738-1771), a professor of the University of Halle, who, after flattering Lessing, had attacked him, and sought to establish a kind of intellectual despotism by means of critical journals which he directly or indirectly controlled. In connection with this controversy Lessing wrote his brilliant little treatise, Wie die Alten den Tod gebildet (1769), contrasting the medieval representation of death as a skeleton with the Greek conception of death as the twin-brother of sleep. Instead of settling in Italy, as he intended, Lessing accepted in 1770 the office of librarian at Wolfenbüttel, a post which was offered to him by the hereditary prince of Brunswick. In this position he passed his remaining years. For a time he was not unhappy, but the debts which he had contracted in Hamburg weighed heavily on him, and he missed the society of his friends; his health, too, which had hitherto been excellent, gradually gave way. In 1775 he travelled for nine months in Italy with Prince Leopold of Brunswick, and in the following year he married Eva König, the widow of a Hamburg merchant, with whom he had been on terms of intimate friendship. But their happiness lasted only for a brief period; in 1778 she died in childbed. Soon after settling in Wolfenbüttel, Lessing found in the library the manuscript of a treatise by Berengarius of Tours on transubstantiation in reply to Lanfranc. This was the occasion of Lessing's powerful essay on Berengarius, in which he vindicated the latter's character as a serious and consistent thinker. In 1771 he published his Zerstreute Anmerkungen über das Epigramm, und einige der vornehmsten Epigrammalisten -- a work which Johann Gottfried Herder described as "itself an epigram." Lessing's theory of the origin of the epigram is somewhat fanciful, but no other critic has offered so many pregnant hints as to the laws of epigrammatic verse, or defended with so much force and ingenuity the character of Martial. In 1772 he published Emilia Galotti, a tragedy which he had begun many years before in Leipzig. The subject was suggested by the Roman legend of Virginia, but the scene is laid in an Italian court, and the whole play is conceived in the spirit of the "tragedy of common life." Its defect is that its tragic conclusion does not seem absolutely inevitable, but the characters -- especially those of the Gräfin Orsina and Marinelli, the prince of Guastalla's chamberlain who weaves the intrigue from which Emilia escapes by death, are powerfully drawn. Having completed Emilia Galotti, which the younger generation of playwrights at once accepted as a model, Lessing occupied himself for some years almost exclusively with the treasures of the Wolfenbüttel library. The results of these researches he embodied in a series of volumes, Zur Geschichte und Literatur, the first being issued in 1773, the last in the year of his death. The last period of Lessing's life was devoted chiefly to theological controversy. H. S. Reimarus (1694-1768), professor of oriental languages in Hamburg, who commanded general respect s a scholar and thinker, wrote a book entitled Apologie oder Schutzschrift für die vernünftigen Verehrer Gottes. His standpoint vas that of the English deists, and he investigated, without hesitation, the evidence for the miracles recorded in the Bible. The manuscript of this work was, after the author's death, entrusted by his daughter to Lessing, who published extracts from it in his Zur Geschichte und Literatur in in 1774-78. These extracts, the authorship of which was not publicly avowed, were known as the Wolfenbütteler Fragmente. They created profound excitement among orthodox theologians, and evoked many replies, in which Lessing was bitterly condemned for having published writings of so dangerous a tendency. His most formidable assailant was Johann Melchior Goeze (1717-1786), he chief pastor of Hamburg, a sincere and earnest theologian, but utterly unscrupulous in his choice of weapons against an opponent. To him, therefore, Lessing addressed in 1778 his most elaborate answers -- Eine Parabel, Axiomata, eleven letters with the title Anti-Goeze, and two pamphlets in reply to an inquiry by Goeze as to what Lessing meant by Christianity. These papers are not only full of thought and learning; they are written with a grace, vivacity and energy that make them hardly less interesting today than they were to Lessing's contemporaries. He does not undertake to defend the conclusions of Reimarus; his immediate object is to claim the right of free criticism in regard even to the highest subjects of human thought. The argument on which he chiefly relies is that the Bible cannot considered necessary to a belief in Christianity, since Christianity was a living and conquering power before the New Testament in its present form was recognized by the church. The true evidence for what is essential in Christianity, he contends, is its adaptation to the wants of human nature; hence the religious spirit is undisturbed by the speculations of the boldest thinkers. The effect of this controversy was to secure wider freedom for writers on theology, and to suggest new problems regarding the growth of Christianity, the formation of the canon and the essence of religion. The Brunswick government having, in deference to the consistory, confiscated the Fragments and ordered Lessing to discontinue the controversy, he resolved, as be wrote to Elise Reimarus, to try "whether they would let him preach undisturbed from his old pulpit, the stage." In Nathan der Weise, written in the winter of 1778-79, he gave poetic form to the ideas which he had already developed in prose. Its governing conception is that noble character may be associated with the most diverse creeds, and that there can, therefore, be no good reason why the holders of one sect of religious principles should not tolerate those who maintain wholly different doctrines. The play, which is written in blank verse, is too obviously a continuation of Lessing's theological controversy to rank high as poetry, but the representatives of the three religions -- the Mahommedan Saladin, the Jew Nathan and the Christian Knight Templar -- are finely conceived, and show that Lessing's dramatic instinct had, in spite of other interests, not deserted him. In 1780 appeared Die Erziehung des Menschen-geschlechts, the first half of which he had published in 1777 with one of the Fragments. This work, composed a hundred brief paragraphs, was the last, and is one of the most suggestive of Lessing's writings. The doctrine on which its argument is based is that no dogmatic creed can be regarded as final, but that every historical religion had its share in the development of the spiritual life of mankind. Lessing also maintains that history reveals a definite law of progress, and that occasional retrogression may be necessary for the advance of the world towards its ultimate goal. These ideas formed a striking contrast to the principles both of orthodox and of skeptical writers in Lessing's day, and gave a wholly new direction to religious philosophy. Another work of Lessing's last years, Ernst und Falk (a series of five dialogues, of which the first three were published in 1777, the last two in 1780), also set forth many new points of view. Its nominal subject is freemasonry, but its real aim is to plead for a humane and charitable spirit in opposition to a narrow patriotism, an extravagant respect for rank, and exclusive devotion to any particular church. Lessing's theological opinions exposed him to much petty persecution, and he was in almost constant straits for money. Nothing, however, broke his manly and generous spirit. To the end he was always ready to help those who appealed to him for aid, and he devoted himself with growing ardor to the search for truth. He formed many new plans of work, but in the course of 1780 it became evident to his friends that he would not be able much longer to continue his labors. His health had been undermined by excessive work and anxiety, and after a short illness he died at Brunswick on the 15th of February 1781. "We lose much in him", wrote Goethe after Lessing's death, "more than we think." It may be questioned whether there is any other writer to whom the Germans owe a deeper debt of gratitude. He was succeeded by poets and philosophers who gave Germany for a time the first place in the intellectual life of the world, and it was Lessing, as they themselves acknowledged, who prepared the way for their achievements. Without attaching himself to any particular system of philosophical doctrine, he fought error incessantly, and in regard to art, poetry and the drama and religion, suggested ideas which kindled the enthusiasm of aspiring minds, and stimulated their highest energies.